PhD in political science, Vrije Universiteit Brussel. Presently postdoctoral researcher at the Institute for Public Policy and Administration, Kaunas University of Technology. Work focuses on global environmental governance and international institutions. Agriculture established a global network of seed banks which grants facilitated access to crops for breeding purposes while aiming that the resulting commercial benefits are shared fairly and equitably. While the treaty has been successful in terms of access, benefits are not being shared. I analyze the causes for the lack of benefit-sharing in terms of the treaty’s institutional design, implementation challenges and the wider problem structure of plant genetic resources for food and agriculture. Subsequently, I evaluate the options which are currently under discussion for a comprehensive reform. I conclude by proposing a set of measures which would enhance the treaty’s effectiveness both in terms of access to plant genetic resources for food and agriculture and the fair and equitable sharing of relevant benefits. The 2001 International Treaty on Plant Genetic Resources for Food and Agriculture (“Seed Treaty”) grants plant breeders worldwide access to a transnational network of seed banks. Emerging out of the “Seed Wars” of the 1980s (Kloppenburg 1987), it builds upon the principle that plant genetic resources are the common heritage of mankind, as set out in its predecessor agreement, the 1983 International Undertaking (Andersen 2008). At the same time, it integrates aspects of the 1992 Convention on Biological Diversity, most importantly the principle of national sovereignty over genetic resources; while also explicitly enabling the private appropriation of plant genetic resources through intellectual property rights (Rabitz 2017, 58–86). It is a hybrid regime, seeking to strike a balance between access to plant germplasm as a global public good and the sharing of benefits resulting from plant breeding when improved materials are privatized (Coupe and Lewins 2007; Halewood 2013). The linkage between access to genetic resources and the fair and equitable sharing of the benefits arising out of their utilization (Access and Benefit-sharing, ABS) is currently dysfunctional. While access takes place to those crops listed in the Treaty’s Annex I, held by public institutions, and those held by the research centers of the Consultative Group on International Agricultural Research (CGIAR), benefit-sharing is non-existent (OEWG 2015a, 2). The failure of the Seed Treaty to deliver benefits to farmers, primarily those in developing countries (Seed Treaty, article 13.3), has broader implications for access to PGRFA. Without a workable solution, the willingness and capacity of developing countries to provide additional PGRFA as a global public good will decrease. The parties to the Seed Treaty are currently negotiating a package of measures which could lead to formal amendments, the adoption of a protocol, or both (GB 2015). This text engages with the reform debate by attempting to pinpoint the flaws in the Treaty’s institutional design, by evaluating the various options which are currently being debated and, finally, by suggesting an alternative approach that could contribute to the better, mutually-supportive implementation of the access- and benefit-sharing objectives. In section 2, I develop a general framework for understanding the link between the design and effectiveness of ABS regimes. Section 3 focuses on the broader cooperation problems behind ABS from PGRFA. Section 4 identifies problems with the Seed Treaty’s ABS component, the Multilateral System, whereas section 5 points out the strengths and weaknesses of the various reform proposals. Section 6 suggests an alternative approach which, through institutional reform and a phased ratcheting-up of commitments, could allow the Multilateral System to deliver on the benefit-sharing objective without jeopardizing its access component. Within the broader “regime complex” for genetic resources (Raustiala and Victor 2004), the Seed Treaty, the Convention on Biological Diversity (CBD) and its Nagoya Protocol, as well as the World Health Organization’s (WHO) Pandemic Influenza Preparedness Framework all provide operational ABS regimes. Those link access to, and utilization of, genetic resources to various forms of benefit-sharing. The CBD and its Protocol require bilateral negotiations between providers and users, with the conditions of access and the terms of benefit-sharing to be jointly agreed-upon. The Pandemic Influenza Preparedness Framework has WHO member states share influenza viruses with pandemic potential multilaterally, including with vaccine manufacturers, with the latter agreeing to share resulting benefits such as vaccines and diagnostic technology with developing countries. The Seed Treaty grants facilitated access to a transnational network of seed banks and envisages both voluntary- and mandatory benefit-sharing, with funds intended to primarily flow to farmers in developing countries (Rabitz 2017). In addition to those three regimes, discussions or formal negotiations are currently ongoing on ABS from genetic resources in international waters, Antarctica, forest-, animal- and aquatic genetic resources, as well as genetic resources associated with traditional knowledge (Oberthür and Pozarowska 2013). Across all regimes, ABS involves the following steps: providers (i.e. governments, public research institutions, international agricultural research centers or farming communities) grant access to genetic resources under their control through legal contracts that may be negotiated in full, negotiated in part or pre-defined and non-negotiable. Users (such as public research institutions, universities or biotechnology-, pharmaceutical- and seed companies) acquire and utilize genetic resources under the terms set out with the respective provider. Those terms include the modalities of benefit-sharing, which is to be “fair and equitable”. The criteria of “fairness” and “equity” here refer to a procedural requirement that is satisfied when providers and users agree to the terms under which transactions take place. The types of benefits to be shared differ across regimes, but can include both monetary transfers (i.e. a certain percentage of commercial profits or up-front payments) as well as non-monetary components (i.e. technology transfer, joint ownership of resulting intellectual property or capacity-building initiatives). Sharing can be bilateral, for instance from users to governments or from users to local communities; or multilateral, including through the use of a third-party beneficiary. After access has taken place, ABS regimes provide for different types of monitoring- and compliance mechanisms to ensure that users, potentially having incentives to cheat, fulfill their benefit-sharing obligations. The effectiveness of such regimes, i.e. 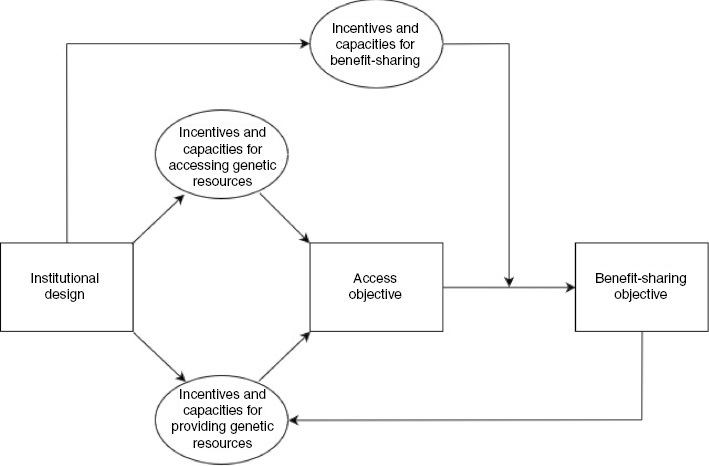 the extent to which they contribute to the achievement of collectively agreed-upon goals (Underdal 2002; Mitchell 2006), needs to be evaluated in two dimensions: in how far do they facilitate access to genetic resources for fostering innovations of potential value for society; and, given that those innovations will only benefit the providers of genetic resources indirectly, if at all, in how far do they contribute to the fair and equitable sharing of benefits? The second objective is contingent on the first, as access is a necessary condition for benefit-sharing. Institutional design matters at four different stages of the overall process (see Figure 1). First, institutional design influences the capacities and incentives of users to access genetic resources through an ABS regime. Such access takes place if users’ expected costs are below their expected gains. Costs arise from three sources: (a) transaction costs associated with access, including from administrative barriers, the negotiation of bilateral ABS contracts or uncertainties regarding legal and regulatory requirements (ten Kate and Laird 1999, 32–33; Wallbott et al. 2014, 38–39); (b) the depth of the benefit-sharing obligation, including whether sharing is mandatory or voluntary, and whether the option of sharing non-monetary benefits is available; and (c) compliance costs subsequent to access, including from any requirement to monitor the utilization of accessed materials throughout the value chain or to provide evidence of utilization in accordance with the applicable laws and regulations (de Carvalho 2005; Andersen 2008, 259–261; Wallbott et al. 2014, 39–40). The expected gains from using an ABS regime, in turn, depend on the genetic resources which it makes available. A regime of broad scope, or one which covers particularly valuable genetic resources, is more attractive to users than one which does not. Attractiveness is also affected by whether the same materials can be sourced elsewhere at lower cost. Also, if commercial users are to share monetary benefits, there must not be restrictions on their ability to claim intellectual property. While intellectual property rights hamper third party access to the protected inventions or plant varieties, they are a pre-condition for monetary benefits to materialize. Second, institutional design influences the capacities and incentives of providers to make genetic resources available for others. On one hand, providing genetic resources can require significant legal and technical expertise, as well as appropriate infrastructure (FAO 2010, 55–88). ABS regimes will be more effective when they assist providers in the building of relevant capacities. On the other hand, the willingness of providers to provide genetic resources depends on whether or not they expect an ABS regime to be effective in regards to benefit-sharing. A regime with shallow benefit-sharing obligations and weak compliance mechanisms, for instance, increases providers’ incentives to shirk their commitments. Jointly, the incentives and capacities of both users and providers determine the extent to which the access objective is achieved: when users are willing and able to draw genetic resources from an ABS regime, and when providers are willing and able to supply those resources, access will be high. The third stage at which institutional design matters, then, is the transition from access to benefit-sharing. In other words: effective ABS regimes ensure that a large amount of potentially shareable benefits is actually being shared. As users lack incentives to share benefits voluntarily after they have been granted access, ABS regimes use different forms of mechanisms for monitoring, compliance management (to support users in meeting their benefit-sharing obligations) and enforcement (to deter non-compliance through the threat of sanctions; Thornton et al. 2005). Monitoring-, compliance- and enforcement mechanisms thus matter at two stages in the overall process: as a factor influencing whether or not users access genetic resources and as a determinant of whether they subsequently share the benefits. This dual role highlights the key trade-off in the design of ABS regimes. Where such mechanisms are weak, users expect lower costs and overall access volume will be higher, yet the transition from access to benefit-sharing will be weaker. Where they are strong, overall access volume will be lower, yet, of those benefits that result, more will be shared. Finally, institutional design has an indirect effect on ABS regime effectiveness through a positive feedback loop from the benefit-sharing objective to provider-side implementation. ABS is a repeated game that is subject to a time lag between access and utilization on one hand, and the generation of shareable benefits on the other. The extent to which benefits are being shared (or are expected to be shared in the future) influences the willingness of providers to grant access to their genetic resources. Benefit-sharing, including through capacity-building or technical assistance, also enhances providers’ capacities to do so. Conversely, where ABS regimes fail to deliver sufficient levels of benefit-sharing, provider incentives and capacities will be low. The existence of both trade-offs and synergies implies that institutional design options may either enhance one objective to the detriment of the other, or simultaneously contribute to both. Trade-offs imply that the overall effectiveness of a given design option cannot readily be assessed. Here, value judgements are required regarding whether to prioritize one objective or the other. In turn, this implies that “best practices” for designing ABS regimes, giving equal weight to both objectives, include facilitative measures for supporting user- and provider compliance, streamlined and unambiguous rules regarding both access and benefit-sharing, and as broad a regime scope as feasible. Conversely, stringent compliance measures, such as disclosure of origin requirements or sanctions (de Carvalho 2005), are biased against the access objective and toward the benefit-sharing one. The effectiveness of international ABS regimes hinges not only on institutional design but also on the characteristics of the specific issue area in which they operate (Mitchell 2006). ABS from PGRFA is a difficult problem for international cooperation due to conflicts on questions of control and ownership. While it is a truism that all governments share a common interest in access to PGRFA for ensuring agricultural sustainability and food security, crucial differences exist regarding the modalities of access regulation and benefit-sharing obligations. PGRFA are used in both the formal- and informal seed sectors as input materials for the creation of new plants and plant varieties.1 Plant breeding typically requires combining dozens of PGRFA that are selected for desirable traits. The resulting plants, in turn, may be used as input materials for further breeding. Throughout most of human history, PGRFA have been exchanged freely across the globe, allowing new and better plants to be developed, ultimately benefiting all of humanity (Murphy 2007). While global food demand increases and food supply is under threat from a variety of sources, including climate change (de Castro et al. 2013), agricultural biodiversity is eroding as a result of global environmental changes and the transition to industrialized agricultural systems based on monocultural plantations and intensive use of fertilizers, pesticides and herbicides (Altieri and Rogé 2010). The commercial attractiveness of cultivars, high-yield plants that are insensitive to evolutionary pressure, reduces “the genetic pool that is available for natural selection, and for selection by farmers and plant breeders” (Esquinas-Alcázar 2005, 947). The loss of agricultural biodiversity thus undermines innovation in plant breeding (Ulukan 2011, 101–102). Accordingly, stakeholders across all groups agree on the necessity of the conservation and sustainable use of agricultural biodiversity – the first two objectives of the Seed Treaty. Disagreements pertain to ABS from PGRFA: should they be considered as the common heritage of mankind and thus be freely available without restrictions? If yes, does this “free availability” extend to the products resulting from the utilization of PGRFA, or should breeders be able to privatize such products through intellectual property rights (Kloppenburg 1987; Andersen 2008)? Or does the sovereignty of nation states extend to PGRFA in such a way that governments may regulate and restrict access to PGRFA (Rosendal 2000)? The debate also connects to the broader problem of declining growth rates in agricultural yields over the last three decades and whether the displacement of public breeding by the private sector is part of the problem or of the solution (Fuglie et al. 2012; ETC Group 2015). The conflict between those paradigms has decisively shaped the evolution of the global governance architecture applicable to plant genetic resources (Raustiala and Victor 2004). The 1983 International Undertaking considered plant genetic resources as the common heritage of mankind, to be “freely available for use, for the benefit of present and future generations” (Article 1). During the biotechnological revolution of the 1980s and 1990s, several landmark decisions by the US Supreme Court and the European Patent Office extended the rights of inventors and breeders to claim intellectual property rights over plants, plant varieties, as well as their genetic parts and components (Fleck and Baldock 2003; Palombi 2009). At the international level, the International Convention for the Protection of New Varieties of Plants (UPOV Convention) provides model legislation for domestic seed laws since 1961. UPOV-style plant breeders’ rights confer a weaker standard of protection than do patents yet, through a series of treaty revisions, protection standards were ratcheted up (Dutfield 2004, 33–37). The two important limitations to plant breeders’ rights which UPOV contains are the “breeders’ exemption” and the “farmers’ privilege”. The former allows the unauthorized use of protected for specific purposes. The latter defines the extent to which farmers can save and re-use protected varieties without authorization by the right holder. Over time, the scope of both exceptions has been whittled down. Plant breeders’ rights under the present, 1991 version of UPOV are thus relatively close to the protection standards of utility patents (Andersen 2008, 155–160; Chiarolla and Jungcurt 2011, 45–47). In addition, the World Trade Organization’s 1995 Agreement on Trade-related Aspects of Intellectual Property Rights (TRIPS) requires parties to grant patents on plant varieties and/or to protect them with an “effective sui generis system” (Article 27.3.b), such as provided for by UPOV. Having historically been a club of mainly industrialized countries, UPOV membership thus spiked after 1995 as developing countries sought ways to comply with their TRIPS obligations (Dutfield 2004, 37). In reaction to increasing intellectual property claims in the 1980s, developing countries had pushed for the recognition of national sovereignty over genetic resources under the 1992 CBD (Dutfield 2004, 3–13). The CBD gives governments the right to determine the conditions of access to genetic resources originating from their respective territories (Article 15.1). Users that want to access such resources need to obtain the provider country’s Prior Informed Consent and, subsequently, negotiate the modalities of benefit-sharing and other relevant provisions in the form of bilateral contracts, or Mutually Agreed Terms. As PGRFA fall within the scope of the CBD, provider countries suddenly had incentives to leverage their sovereign control for obtaining monetary transfers through such bilateral contracts. Both intellectual property rights and national sovereignty over genetic resources thus threatened the public-good character of PGRFA (Halewood 2013). Governments representing powerful commercial interests preferred open access without limitations to intellectual property claims. Many of those (industrialized) countries also possess extensive ex situ collections of PGRFA acquired from countries of the Global South. Governments of several “emerging economies”, such as Brazil, China and India equally control large ex situ collections yet, in the absence of significant intellectual property claims from commercial breeders, preferred to monetize their genetic heritage through the bilateral approach of the CBD. Finally, and at the risk of overgeneralization, governments with neither significant ex situ collections nor commercial users broadly preferred a solution that would allow continued access to PGRFA while feeding benefits back into the conservation and sustainable use of agricultural biodiversity. These interest differentials had important implications for the negotiation of the Seed Treaty (Coupe and Lewins 2007). They also shape the Treaty’s subsequent implementation and its prospects for reform. As ABS from PGRFA requires multilateral cooperation, and as countries differ in terms of their underlying preferences, the Treaty integrates aspects of the common heritage-, private property- and national sovereignty regimes. Arguably, this is what accounts for its inconsistencies. Parties to the CBD recognized the special nature of PGRFA early on: the CBD’s bilateral approach to ABS would stifle innovation in the agricultural sector by requiring breeders to negotiate contractual terms with the providers of each and every PGRFA they would use as input material. A new, specialized instrument covering agricultural biodiversity and ABS from PGRFA had to be developed. The challenge was: how to craft an instrument that is suited to the task at hand without conflicting with the principles and objectives of the CBD and other agreements, notably UPOV and TRIPS? The FAO Conference adopted the Seed Treaty in 2001, with only the US and Japan abstaining.2 It entered into force in 2004 and, in 2006, its governing body adopted the Standard Material Transfer Agreement (SMTA) as a crucial component of its ABS regime, the Multilateral System. The System grants facilitated access to 64 crops listed in the Treaty’s Annex I that are in the public domain and under the management and control of the contracting parties (Article 11.2). It also covers all (Annex I and non-Annex I) PGRFA held by the CGIAR centers and acquired prior to the Treaty’s entry into force, as well as all their Annex I PGRFA acquired afterwards (Article 15.1). Use of those materials is restricted to agricultural purposes. Any use for other ends falls within the ambit of the CBD. The SMTA governs transfers of PGRFA from the Multilateral System to users, as well as any subsequent transfers. Users commercializing a resulting product under intellectual property rights that “restrict” facilitated access to the product (understood to refer to patents) must make mandatory payments of 1.1% of product sales minus 30% to the Multilateral System. Users commercializing products under “non-restrictive” property rights (understood to refer to UPOV-style plant breeders’ rights) are encouraged to make voluntary payments. An alternative payment scheme at a discounted rate of 0.5% of all seed sales of the same crop species is available for both situations. In addition, both Treaty and SMTA prohibit any intellectual or other property claims that would “limit the facilitated access to the [PGRFA], or their genetic parts and components, in the form received from the Multilateral System” (Article 12.3.d; article 6.2 SMTA). Over 3.3 million samples have been distributed under the Multilateral System’s SMTA as of February 2017,3 yet no corresponding payments, either mandatory or voluntary, have so far been made. The reasons for the lack of benefit-sharing are hard to discern, yet different explanations exist. First, seeds incorporating materials from the Multilateral System might not yet be ready for the market, as the breeding and commercialization of new plants takes up to 15 years. Second, plants, plant varieties and related inventions incorporating PGRFA received from the System are being patented, thus triggering the mandatory payment obligation, yet patentees are not complying with their legal obligations. Third, users encouraged to make voluntary payments see no reason to do so. Fourth, users might avoid the Multilateral System and source PGRFA from seed banks that do not require benefit-sharing (Moeller and Stannard 2013). My theoretical framework suggests five different problems with the Seed Treaty’s institutional design that could explain the lack of benefit-sharing. First, the Multilateral System’s narrow scope reduces its attractiveness for users, thus limiting the generation of shareable benefits. Already during the drafting of Annex I, “negotiations became ensnared in a process in which crops became bargaining chips and were added or dropped on national and political grounds” (Coupe and Lewins 2007, 22). Several valuable crops, such as coffee, cotton, soybeans and sugarcane, are excluded. Second, the SMTA imposes high transaction costs on users. As the benefit-sharing obligation for PGRFA received from the Multilateral System is sustained for plants that go through multiple cycles of crossing, users need to track and trace utilization through their entire breeding programmes. The absence of a sunset clause which would allow recipients to escape their obligations after a specified period of time implies that those obligations continue indefinitely. Third, users face legal uncertainty from the Treaty’s (Articles 12.3.d and 13.2.d.ii) and the SMTA’s (Articles 6.2 and 6.7) language on intellectual property rights and benefit-sharing. There is a protracted legal debate on what constitutes “restrictive” versus “non-restrictive” property rights, including whether UPOV-style plant breeders’ rights are genuinely non-restrictive, for instance in the context of informal seed systems where they hamper “informal exchange and sale of seeds” and limit “opportunities for on-farm breeding, varietal improvement and selection by farmers” (Chiarolla and Jungcurt 2011, 5). To the extent that plant breeders’ rights negatively affect research and breeding in such contexts, they constitute “restrictive” property rights and should trigger the mandatory benefit-sharing obligation. In addition, there are no criteria for defining the innovation threshold between materials that are “in the form received” (and thus prohibited from being claimed as intellectual property) and those which have been sufficiently improved to escape the article 12.3.d prohibition. Finally, there is uncertainty on what constitutes the “parts and components” of PGRFA, referred to in the same article, to which the prohibition extends (Correa 2006; Schaffrin et al. 2006; Chiarolla 2008). Connected to the previous point is, fourth, the problem of differentiated obligations based on whether or not users seek out patent- or plant variety protection. If patents trigger the mandatory benefit-sharing obligation whereas plant breeders’ rights do not, the shortfall of benefit-sharing is likely connected to the inadmissibility of plant patents in most jurisdictions, notable exceptions being Japan and the US. Users from other jurisdictions will thus never incur the mandatory benefit-sharing obligation for new plant varieties incorporating PGRFA from the Multilateral System. However, the obligation would be triggered for those users for any (food- and feed-related) inventions incorporating such PGRFA that are not plant varieties. Under the European Patent Convention, this includes hybrid plants that, due to their lack of stable reproduction, do not constitute plant varieties. As “voluntary benefit sharing is an illusion” (Tvedt 2014, 161) for commercial users of PGRFA, differentiated obligations are likely to be a major factor in the Seed Treaty’s current malaise. The fifth and final problem relates to provider-side implementation. Many developing countries are not making Annex I PGRFA that are in the public domain and under their management and control available, or fail to notify their availability. On one hand, those countries frequently lack the required technical- and administrative capacities (Chiarolla and Jungcurt 2011, 16–17). This includes adequate seed banks (FAO 2010, 71–83). Failure to include PGRFA in the Multilateral System also results from a “significant lack of awareness and understanding of the Multilateral System at all levels and across the different stakeholder groups” (OEWG 2014, 5). On the other hand, developing countries may also be unwilling to fully implement their obligations due to the lack of benefit-sharing and “because they feel that developed countries have neither submitted enough funds to the Treaty’s funding strategy nor adopted any clear measure to share information, technologies and capacities for PGRFA conservation and use” (Noriega et al. 2013, 217; see also ENB 2015, 12). Merely 12 out of 139 contracting parties are even fulfilling their reporting obligations regarding measures taken for domestic implementation (Compliance Committee 2017, 3). Clearly, the Treaty does not provide the proper incentives and capacities for providers to live up to their commitments. This may also be related to the collective action problem in treaty implementation: contracting parties face direct costs from bringing their domestic legislation, regulations and seed banks in line yet can only expect diffuse gains from doing so, considering that benefits are to be shared multilaterally, not bilaterally. A working group under the Treaty’s Governing Body concludes that “the structural problems in the current functioning of the Multilateral System – including avoidance of access to or exchange of materials under SMTAs, the availability of alternative sources of material without financial obligations, and the total lack of the voluntary payments foreseen in the Treaty and in the SMTA – cannot be overcome by revisions to the SMTA alone” (OEWG 2015a, 2). Negotiations are ongoing to revise the SMTA and, possibly, to amend the Treaty or adopt a protocol. The discussion coalesces around two major issues. A subscription system could replace the SMTA as the primary means of accessing the Multilateral System. Also, the Multilateral System’s scope could possibly be expanded to encompass all PGRFA, not merely those listed in Annex I. The latter issue has important links to problems of domestic implementation, which I consider as well. Finally, there is the question of how to design the interface between a reformed Seed Treaty and the Nagoya Protocol to the CBD, which entered into force in 2014. A major proposal in the intergovernmental debate is the adoption of a subscription model, where users pay a fee for being granted access to all, or a select number of, PGRFA within the Multilateral System’s scope. Such a model is already being successfully implemented within the World Health Organization’s Pandemic Influenza Preparedness Framework, an ABS mechanism the multilateral sharing of viruses, derived vaccines and other benefits (PIP-FW AG 2015). Allowing access under a single subscription instead of multiple SMTAs could reduce users’ transaction costs. Subscriptions can also reduce compliance costs if subscribers do not need to track and trace the flow of individual PGRFA under SMTAs through their entire breeding programmes, but can use their subscriber status to demonstrate compliance. By linking payment obligations to access (rather than commercialization, as under the current SMTA), a subscription model could also ensure that benefit-sharing commences timely (ENB 2015, 13). As user-to-user transfers of PGRFA are common, the system would allow free exchanges among subscribers. The subscription model would complement a revised SMTA to govern transfers from subscribers to non-subscribers (OEWG 2015b). The chief issues in regards to the design of a subscription model are how or whether to differentiate payment obligations, whether to include voluntary forms of benefit-sharing, and whether subscriptions would grant access to all PGRFA in the Multilateral System’s scope, or whether access on a crop-by-crop basis would be available as well (OEWG 2015b, 2016a). Differentiated user obligations would acknowledge that the types and levels of benefits generated through access to PGRFA differ across commercial breeders, private breeders, CGIAR centers, national agricultural research centers, universities, and so forth. A 2016 proposal suggests that payment obligations could be a percentage of turnover or seed sales. Such a system would not only be simple to implement but would also take into account the interests and capacities of non-commercial users, as their subscriptions would essentially be for free (OEWG 2016a). Similarly, the distinction between mandatory benefit-sharing (for users claiming restrictive intellectual property rights) and voluntary benefit-sharing (for non-restrictive ones) could be maintained under a reformed system (OEWG 2016b). Subscriptions could also grant access to single crops or crop categories, or to all materials within the Multilateral System’s scope. The former option allows users to pick and choose those PGRFA which they consider most useful for their purposes, at a lower cost than that which would have to be paid for access to the full Multilateral System. The latter option facilitates subscriber-to-subscriber transfers as well as the calculation of subscription fees. Different types of crops could also require different levels of payment. Differentiating subscription fees across user categories, based on the scale of their respective commercial activities, is both viable and enhances non-commercial users’ capacities to access the Multilateral System. Other types of differentiation would have more ambiguous effects. Maintaining voluntary payments for non-restrictive intellectual property rights would fail to remedy what is arguably a major cause of the shortfall of benefit-sharing flows – the reason for initiating the reform process in the first place. While reducing benefit-sharing costs for some user categories, the distinction would simultaneously increase their compliance costs, as determining the level of mandatory payments would require parsing out the market value of products under restrictive intellectual property rights from those under non-restrictive ones. Granting access on a crop-by-crop basis instead of to all PGRFA within the scope of the Multilateral System will enhance user incentives to access those materials which they consider particularly promising, if such crop-by-crop subscriptions are comparatively cheaper. Simultaneously, the larger complexity of such a scheme could reduce users’ compliance capacities. As opaque rules already hamper stakeholder participation in the Multilateral System in its present form (OEWG 2014, 5), the advantages of realizing larger benefit-sharing flows from high-value PGRFA need to be carefully weighed against the problems resulting from unwieldy, cumbersome rules. Finally, an issue that does not form part of the international discussion is the Article 12.3.d prohibition on intellectual property claims on materials “in the form received”. Despite the predominant interpretation that this provision does not create conditions for intellectual property claims beyond what is already provided for in UPOV, TRIPS and relevant national legislation (Schaffrin et al. 2006), the article might create legal uncertainty for users. Workable solutions for (monetary) benefit-sharing require that intellectual property rights are available as, otherwise, commercial breeders have few incentives to develop new plant varieties from PGRFA drawn from the Multilateral System. The Treaty’s benefit-sharing provisions, moreover, implicitly legitimize and endorse such intellectual property rights. If commercial breeders are to share monetary benefits, the Treaty should be unambiguous regarding their ability to claim intellectual property. Political obstacles notwithstanding, the current reform might thus be an opportunity to do away with this provision. A recent stakeholder consultation concludes that “an increased use of the Multilateral System could be expected from the expansion of Annex I” (OEWG 2014, 6). Many commercially interesting crops are currently excluded. If more materials were available, more access would take place and more benefits could, in principle, be shared. Yet this is where we face a chicken-or-egg problem: contracting parties are skeptical of providing additional resources to a system which has so far failed in sharing the resulting benefits. Brazil, for instance, possessing some of the most-advanced ex situ collections in the developing world, argues that “a possible expansion of the Annex I should only occur after ensuring that the MLS [Multilateral System] is working in its enhanced format” (OEWG 2015c, appendix 3). At the sixth session of the Treaty’s Governing Body, in October 2015, several regional groups of developing countries “clearly stated that they will not agree to negotiate an expansion of Annex I until there is proof of user payments” (ENB 2015, 13). The history of the treaty’s drafting process suggests that re-negotiating Annex I will face formidable political challenges (Coupe and Lewins 2007, 29). Expanding the Multilateral System’s coverage, however, offers clear synergies between the access- and the benefit-sharing objectives, given that appropriate institutional mechanisms are in place to ensure user compliance. A revised Annex I could give a larger role to private holdings of PGRFA. The Treaty already stipulates that contracting parties shall ”encourage natural and legal persons within their jurisdiction” to include their collections in the Multilateral System (Article 11.3). So far, this has met with remarkably little success. Private collections are “shrouded in secrecy” and “companies are not willing to share much information about the size and contents of their ex situ seed collections” (Chiarolla and Shand 2013, 5). As an ultima ratio, the Governing Body has the option, under Article 11.4, of excluding private users which have not made their own PGRFA available to the Multilateral System from further access. A decision on this matter is regularly being postponed.4 While invoking Article 11.4 would ameliorate freeriding by private breeders, it would arguably enhance the current problem of SMTA avoidance. Thus, it would only be effective in combination with structural reforms that significantly enhance the attractiveness of the Multilateral System to users. Alternatively, expanding the Multilateral System’s coverage, for instance to include all PGRFA, would limit the possibility of sourcing PGRFA from seed banks that do not require benefit-sharing, thus compelling users to place their own collections in the Multilateral System in order to be granted facilitated access themselves. An issue that is functionally connected is provider-side implementation. Both in the Multilateral System’s present form as well as in a potentially expanded one, the implementation deficit hampers access and thus reduces the overall volume of shareable benefits. Despite its relevance for the functioning of the Multilateral System and its implications for the political feasibility of structural reforms, the OEWG does not have an explicit mandate to discuss provider-side implementation. A previous Advisory Technical Committee, which possessed such a mandate, discontinued its work in 2012. Implementation is currently being addressed in the FAO’s Commission on Genetic Resources for Food and Agriculture (CGRFA), which recently adopted a set of recommendations to facilitate the domestic implementation of ABS across different subsectors, including PGRFA (CGRFA 2016). The Commission is also involved in activities relating to capacity building and technical assistance. Yet, if reforms are to be effective, provider-side implementation needs to be integrated into the larger negotiation package, for instance by negotiating non-binding guidelines under the Treaty’s Governing Body or even by addressing contracting parties’ non-compliance with their treaty obligations through the appropriate institutional channels. A reformed Seed Treaty needs to take into account the relationship with the CBD’s Nagoya Protocol, which entered into force in October 2014. The Protocol provides a general framework for access, benefit-sharing and compliance (Buck and Hamilton 2011). It applies to all genetic resources under national sovereignty, including Annex I PGRFA. Where specialized ABS regimes exist, such as the Seed Treaty, those take precedence as long as they are “consistent with” and do not “run counter to” the CBD’s and the Protocol’s objectives (Nagoya Protocol, article 4.4). Beyond the obvious question whether this requirement is satisfied in the absence of fair and equitable benefit-sharing under the Multilateral System, potential tensions exist between the two regimes at both international- and domestic levels. In its domestic implementation, the Multilateral System requires “legal space” so that facilitated access to Annex I PGRFA is not subject to the same restrictive conditions as genetic resources falling within the Nagoya Protocol’s regulatory scope. That is, PGRFA from the Multilateral System need to be exempted from the requirements to obtain the Prior Informed Consent of the relevant national authorities, to subsequently negotiate Mutually Agreed Terms and to demonstrate compliance with both requirements. Parties to the Nagoya Protocol are obliged to designate checkpoints which “collect or receive […] relevant information related to prior informed consent, to the source of the genetic resource, to the establishment of mutually agreed terms, and/or to the utilization of genetic resources” (article 17.1.a.i). Accordingly, users must be able to demonstrate that the Protocol’s implementing legislation does not apply for their utilization of PGRFA received from, and for the purposes of, the Multilateral System. Accordingly, governments should recognize the SMTA as an internationally-recognized certificate of compliance, in line with Nagoya Protocol articles 17.2 to 17.4 (OEWG 2015a, 17). Similarly, the drafters of a revised SMTA and a subscription system would need to ensure that both fulfill the requirements set out in Nagoya Protocol article 17.4. The International Treaty’s Multilateral System makes a major contribution towards food security and agricultural sustainability. Yet it suffers from insufficient domestic implementation and a problematic institutional design that hampers the effective sharing of benefits. The entry-into-force of the Nagoya Protocol, moreover, changes the wider incentive structure of both users and providers: as it operationalizes the CBD’s bilateral approach to benefit-sharing, users of genetic resources have stakes in expanding the Multilateral System’s coverage in order to be able to obtain breeding materials under more favorable conditions than under the Protocol; conversely, providers of genetic resources have incentives to leave potentially valuable PGRFA outside the scope of the Multilateral System so that they may receive larger individual pay-offs from bilateral, rather than multilateral, benefit-sharing. The easiest way to ensure that benefits arising out of the utilization of PGRFA are properly shared would be a levy on seed sales on the national level which would be directly contributed to the Multilateral System’s Benefit-Sharing Fund. This would allow the de-linking of access from benefit-sharing and would make the tracking of PGRFA through the value chain superfluous (Stannard 2013). Yet, in terms of politically feasible options, there is no silver bullet for resolving the Seed Treaty’s malaise. Instead, different elements will need to be combined into a larger reform package. Any such package will face the challenge of creating more favorable conditions for users while ensuring fair and equitable benefit-sharing for providers. If financial obligations and transaction costs are too high, users will avoid the System. If benefit-sharing is too low, contracting parties will not make additional materials available. Finally, given the long time required for plant breeding, any changes made today will only result in increased benefit-sharing streams many years into the future. A viable reform package thus must increase the confidence of contracting parties that enhanced implementation and the provision of further PGRFA will eventually pay off. A possible way forward is a phased approach combined with a hybrid SMTA/subscription model. Annex I would be expanded over several, pre-determined steps while contracting parties would commit to successively improving domestic implementation. Subscription fees for access to the whole of Annex I would be proportional to a prospective user’s overall seed sales. With each successive phase, the respective percentage which new users would need to pay to subscribe to the system would increase. Users subscribing early on thus maintain their favorable fees into the future. The prospects of both progressively-increasing fees and the stepwise expansion of Annex I, in turn, create economic incentives for users to subscribe sooner rather than later. As subscriptions go up and fees are shared multilaterally, contracting parties will grow more confident about making additional PGRFA available. Growing confidence and increasing economic utility thus reinforce each other. This approach must also entail better implementation of existing obligations under the Treaty. While growing confidence can be expected to improve implementation, enhanced capacity building will equally be required. Also, a revised SMTA, possibly with greater legal clarity, needs to complement a subscription model in order to govern transfers between providers and non-providers. Crucially, such a revised SMTA needs to be less attractive than the subscription model itself. One way to do so would be to extend the SMTA’s mandatory benefit-sharing obligation to plant variety protection, whereas recipients which do not claim any intellectual property would still be exempted from mandatory payment. The Seed Treaty is currently at a critical juncture. The Nagoya Protocol has shifted the incentives of both providers and users of PGRFA. The lack of benefit-sharing under the Multilateral System is eroding the trust of contracting parties. The initial reasons which prompted the negotiation of the Treaty in the first place, global interdependence in crop breeding, genetic erosion in agriculture and the shift of commercial innovation towards a small amount of high-yield cash crops, have become more urgent, not less. The present political dynamics offer a window of opportunity for taking the Seed Treaty to the next level. The coming years will decide whether it will make a significant contribution to agricultural sustainability and food security or whether it will become a footnote in the annals of international environmental policy. 1Unlike “plants”, “plant varieties” are defined as stable, distinct and uniform. While all plant varieties are plants, some plants (such as hybrids) are not plant varieties. 2Japan joined the Treaty in 2013; the US Senate consented to ratification in September 2016. 4See Governing Body Resolution 1/2013, part IX. The author would like to thank the anonymous reviewers for their helpful comments and suggestions. Altieri, M and Rogé, P (2010). The Ecological Role and Enhancement of Biodiversity in Agroecosystems. Agriculture, Biodiversity and Markets. Livelihoods and Agroecology in Comparative Perspective. Lockie, S and Carpenter, D. eds. London/Washington, DC: Earthscan. Andersen, R (2008). Governing Agrobiodiversity. Plant Genetics and Developing Countries. Aldershot: Ashgate. Buck, M and Hamilton, C (2011). The Nagoya Protocol on Access to Genetic Resources and the Fair and Equitable Sharing of Benefits Arising from their Utilization to the Convention on Biological Diversity. Review of European Community & International Environmental Law 20(1): 47–61. https://doi.org/10.1111/j.1467-9388.2011.00703.x. CGRFA. ABS Elements. Elements to Facilitate Domestic Implementation of Access and Benefit-sharing for Different Subsectors of Genetic Resources for Food and Agriculture. Rome: Food and Agriculture Organization. Chiarolla, C (2008). Plant Patenting, Benefit Sharing and the Law Applicable to the Food and Agriculture Organisation Standard Material Transfer Agreement. Journal of World Intellectual Property 11(1): 1–28. https://doi.org/10.1111/j.1747-1796.2007.00332.x. Chiarolla, C and Jungcurt, S (2011). Outstanding Issues on Access and Benefit-Sharing under the Multilateral System of the International Treaty on Plant Genetic Resources for Food and Agriculture. Berne Declaration/Norwegian Development Fund. Correa, C. M (2006). Considerations on the Standard Material Transfer Agreement under the FAO Treaty on Plant Genetic Resources for Food and Agriculture. Journal of World Intellectual Property 9(2): 137–165. https://doi.org/10.1111/j.1422-2213.2006.00272.x. Coupe, S and Lewins, R (2007). Negotiating the Seed Treaty. Rugby: Practical Action Publishing.. https://doi.org/10.3362/9781780441252. de Carvalho, N. P (2005). From the Shaman’s Hut to the Patent Office: In Search of a TRIPS-Consistent Requirement to Disclose the Origin of Genetic Resources and Prior Informed Consent. Washington University Journal of Law & Policy 17: 111–186. De Castro, P, Adinolfi, F, Capitanio, F, Di Falco, S and di Mambro, A (2013). The Politics of Land and Food Scarcity. London/New York: Routledge. Dutfield, G (2004). Intellectual Property, Biogenetic Resources and Traditional Knowledge. London/Sterling, VA: Earthscan. ENB. Summary of the Sixth Session of the Governing Body of the International Treaty on Plant Genetic Resources for Food and Agriculture: 5–9 October 2015. Earth Negotiation Bulletin 9(656): 1–15. ETC Group. Breaking Bad: Big Ag Mega-mergers in Play Dow+DuPont in the Pocket? Next Demonsanto? ETC Group Communiqué 115. Montreal: Action Group on Erosion, Technology and Concentration. Esquinas-Alcázar, J (2005). Protecting Crop Genetic Diversity for Food Security: Political, Ethical and Technical Challenges. Nature Reviews Genetics 6(12): 946–953. https://doi.org/10.1038/nrg1729. FAO. The Second Report on the State of the World’s Plant Genetic Resources for Food and Agriculture. Rome: Food and Agriculture Organization. Fleck, B and Baldock, C (2003). Intellectual Property Protection for Plant-related Inventions in Europe. Nature Reviews Genetics 4(10): 834–838. https://doi.org/10.1038/nrg1184. Fuglie, K, Heisey, P, King, J, Pray, C. E and Schimmelfennig, D (2012). The Contribution of Private Industry to Agricultural Innovation. Science 338(6610): 1031–1032. https://doi.org/10.1126/science.1226294. GB. Implementation of the Multilateral System of Access and Benefit-Sharing. Resolution 1/2013 of the Governing Body to the International Treaty on Plant Genetic Resources for Food and Agriculture. GB. Measures to Enhance the Functioning of the Multilateral System of Access and Benefit-Sharing. Draft Resolution 1/2015 of the Governing Body to the International Treaty on Plant Genetic Resources for Food and Agriculture. Halewood, M (2013). What Kind of Goods are Plant Genetic Resources for Food and Agriculture? Towards the Identification and Development of a New Global Commons. International Journal of the Commons 7(2): 278–312. https://doi.org/10.18352/ijc.412. Kloppenburg, J. R (1987). Seed Wars: Common Heritage, Private Property, and Political Strategy. Socialist Review 95: 7–41. Mitchell, R. B (2006). Problem Structure, Institutional Design, and the Relative Effectiveness of International Environmental Agreements. Global Environmental Politics 6(3): 72–89. https://doi.org/10.1162/glep.2006.6.3.72. Moeller, N. I and Stannard, C (2013). Identifying Benefit Flows. Studies on the Potential Monetary and Non-monetary Benefits Arising from the International Treaty on Plant Genetic Resources for Food and Agriculture. Rome: Food and Agriculture Organization. Murphy, D. J (2007). People, Plants, and Genes. The Story of Crops and Humanity. Oxford/New York: Oxford University Press.. https://doi.org/10.1093/acprof:oso/9780199207145.001.0001. Noriega, I. L, Wambugu, P and Mejías, A (2013). Assessment of Progress to Make the Multilateral System Functional: Incentives and Challenges at the Country Level. Crop Genetic Resources as a Global Commons: Challenges in International Law and Governance. Halewood, M and López Noriega and S. Louafi, I eds. London: Earthscan, pp. 201–227. Oberthür, S and Pozarowska, J (2013). Managing Institutional Complexity and Fragmentation: The Nagoya Protocol and the Global Governance of Genetic Resources. Global Environmental Politics 13(3): 100–118. https://doi.org/10.1162/GLEP_a_00185. OEWG. An analysis of the factors that influence the willingness of stakeholder groups to make contributions to the benefit-sharing fund and to access plant genetic resources for food and agriculture from the multilateral system. Ad-hoc Open-ended Working Group to Enhance the Functioning of the Multilateral System. Second meeting. IT/OWG-EFMLS-2/14/6. OEWG. Commentary on Structural Elements for the Development of a Subscription Model/System. Ad-hoc Open-ended Working Group to Enhance the Functioning of the Multilateral System. Fourth Meeting. IT/OWG-EFMLS-4/15/4. OEWG. Development of a Subscription System for Users of Plant Genetic Resources for Food and Agriculture under the Treaty (Measure III): Background Information. Ad-hoc Open-ended Working Group to Enhance the Functioning of the Multilateral System. Third Meeting. IT/OWG-EFMLS-3/15/Inf. 5. OEWG. Submissions received by the Working Group during the Biennium, in preparation for the subscription system and the draft revised Standard Material Transfer Agreement. Ad-hoc Open-ended Working Group to Enhance the Functioning of the Multilateral System. Fourth Meeting. IT/OWG-EFMLS-4/15/Inf. 3. OEWG. Note by the Co-chairs on the Outcome of the Friends of the Co-chairs Groups. Ad-hoc Open-ended Working Group to Enhance the Functioning of the Multilateral System. Fifth Meeting. IT/OWG-EFMLS-5/16/4. OEWG. Report from the Friends of the Co-chairs Group on Access Mechanisms and Payment Rates. Ad-hoc Open-ended Working Group to Enhance the Functioning of the Multilateral System. Fifth Meeting. IT/OWG-EFMLS-5/16/Inf.5. Palombi, L (2009). Gene Cartels: Biotech Patents in the Age of Free Trade. Cheltenham: Edward Elgar.. https://doi.org/10.4337/9781848447431. PIP-FW AG. Pandemic Influenza Preparedness Framework Advisory Group Annual Report to the Director-General under PIP Framework Section 7.2.5. Annual Report. Geneva: World Health Organization. Rabitz, F (2017). The Global Governance of Genetic Resources: Institutional Change and Structural Constraints. London/New York: Routledge. Raustiala, K and Victor, D. G (2004). The Regime Complex for Plant Genetic Resources. International Organization 58(2): 277–309. https://doi.org/10.1017/S0020818304582036. Rosendal, K (2000). The Convention on Biological Diversity and Developing Countries. Boston: Kluwer Academics.. https://doi.org/10.1007/978-94-015-9421-9. Schaffrin, D, Görlach, B and Gerstetter, C (2006). The International Treaty on Plant Genetic Resources for Food and Agriculture – Implications for Developing Countries and Interdependence with International Biodiversity and Intellectual Property Law. Berlin: Ecologic Institute. Stannard, C (2013). The Multilateral System of Access and Benefit Sharing: Could it Have Been Constructed Another Way? In: Crop Genetic Resources as a Global Commons: Challenges in International Law and Governance. Halewood, M, Noriega, I. L and Louafi, S. eds. : 243–264. London: Earthscan. ten Kate, K and Laird, S. A (1999). The Commercial Use of Biodiversity. Access to Genetic Resources and Benefit-sharing. London: Earthscan. Thornton, D, Gunningham, N. A and Kagan, R. A (2005). General Deterrence and Corporate Environmental Behavior. Law & Policy 27(2): 262–288. https://doi.org/10.1111/j.1467-9930.2005.00200.x. Tvedt, M. W (2014). Beyond Nagoya: Towards a Legally Functional System of Access and Benefit Sharing. Global Governance of Genetic Resources. Access and Benefit Sharing after the Nagoya Protocol. Oberthür, S and Rosendal, G. K eds. Abingdon: Routledge, pp. 158–177. Ulukan, H (2011). The Use of Plant Genetic Resources and Biodiversity in Classical Plant Breeding. Acta Agriculturae Scandinavica 61(2): 97–104. https://doi.org/10.1080/09064710903573390. Underdal, A (2002). One Question, Two Answers In: Environmental Regime Effectiveness. Confronting Theory with Evidence. Miles, E. L., Underdal, A., Andresen, S., Wettestad, J., Skjærseth, J. B. and Carlin, E. M. eds. Cambridge, MA/London: MIT Press. Wallbott, L, Wolff, F and Pozarowska, J (2014). The Negotiations of the Nagoya Protocol. Issues, Coalitions and Process. Global Governance of Genetic Resources. Access and Benefit Sharing after the Nagoya Protocol. Oberthür, S and Rosendal, G. K eds. Abingdon: Routledge, pp. 33–59.